I just had to build one and see what all the hoopla was about. 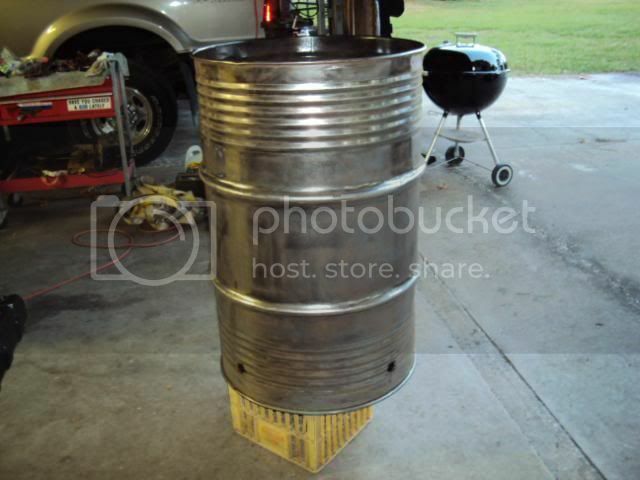 Having built several different types of smokers out of 55 gallon drums, I had to try this one also. Plus, firing up the log burner for smaller cooks just took to long. 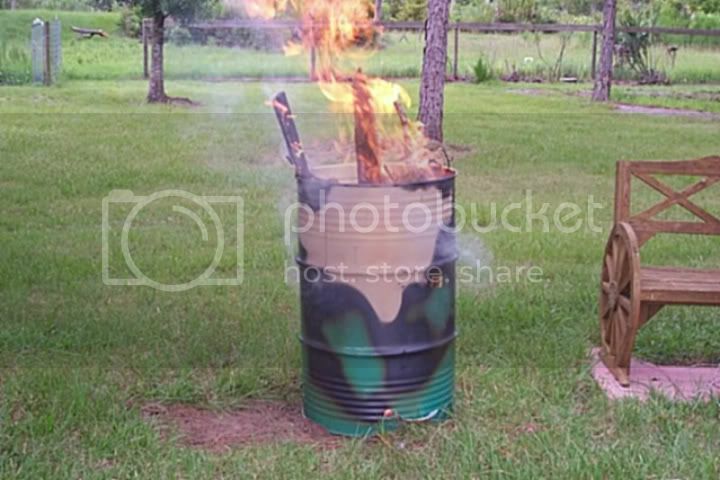 The burn of the open top barrel. Rear wheels. I had an old axle off something stored away and an old metal shelf someone had given me. The $20 score off of craigslist. Came with 2 bags of charcoal. 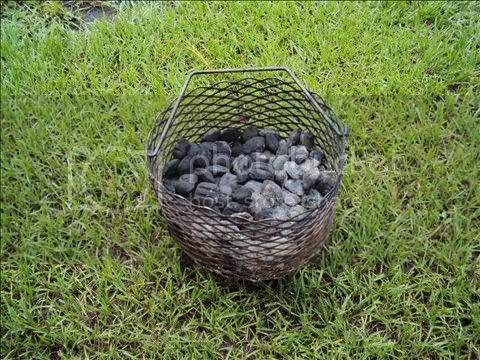 My muscled together charcoal basket. Not as sweet as KAM's but it works just fine. Second seasoning, I had to throw a couple snacks on. Now, with all that said and done here is my final cost. I just sort of dug through my scrap pile and used what I could find. That's it. I had everything else laying around including the gauge I had purchased for another project a couple years back. 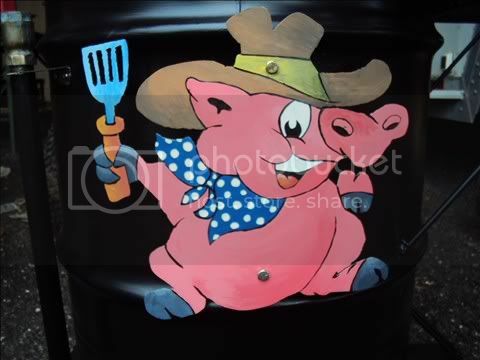 Did you paint "The Cowboy Pig '? Wondering what material he's painted on??? 1buckie, I cut the pig out of a piece of stainless that I kept when I cut a sink hole out of a table. lol The girlfriend does the painting on that kind of stuff for me. I have it spaced off the drum about 3/4 inch to prevent heat damage to the paint. Nice build, I dig that pig he's rowdy as all git out. Very cool and great deal for $40! 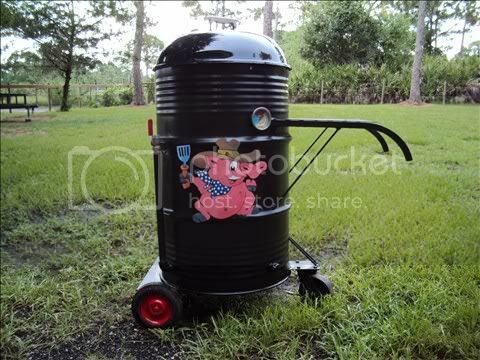 Wish I could find deals like you got on the Weber and the drum! purplewg, the UDS looks great. Looking at yours makes me wanna throw a rock at mine. Thats a pretty cool drum ya got there. Absolute great job on that UDS!! purplewg; Nice, very nice. You know, you could have save $10 using refrigerator magnets for your intake covers. Just kidding, looks great. Looks good, and looks like you had fun doing it, you will forever love it! purplewg, I love it especially the three wheels. The caster idea is a keeper bookmarked my Friend. Tell the little lady that the piggy is spot on very nice work. Nicely done to both of you. So whats gonna be the first long cook? 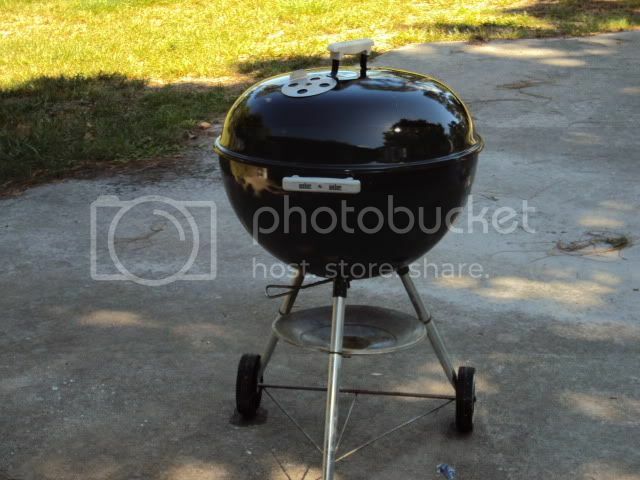 That Weber looks new for $20 and 2 bags of charcoal, that's a great deal. I like the pig addition, your girlfriend looks like that and she can paint also.........some people just have all the luck ! I just wanted to say "Great job on the uds bro!" 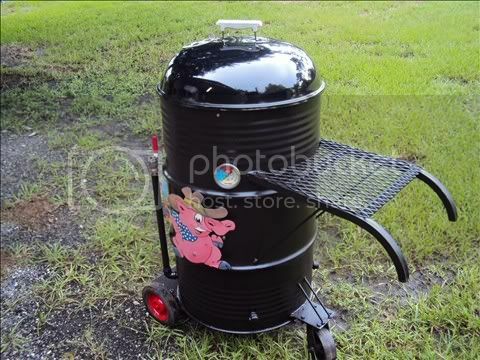 The handle/shelf is as cool as the pig & the wheels are awesome too... Very nice! GF, don’t be tossing no rocks at yours now. I only wish mine turned out as good as some I have seen built. Old Smoke, thank you much. Fredericksburg, great advice. My goal was to build for less $70. I made it. Chuckied, thanks much. The handles were overhead supports I cut off my stock trailer years ago. I knew those old rusty pieces would come in handy! 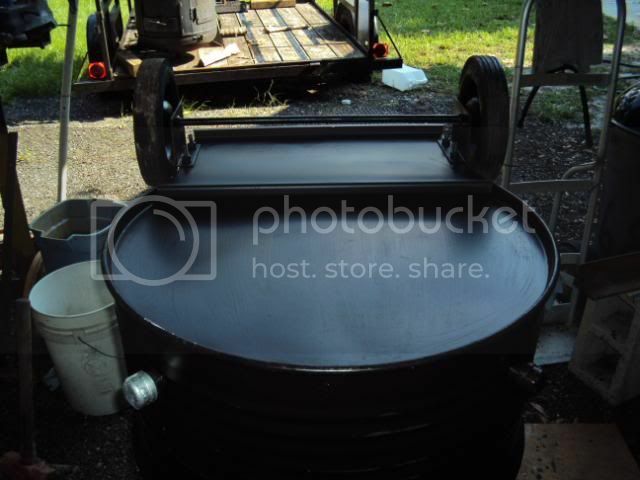 Nice job on the UDS brother! So the GF looks great in a Canadian bikini AND paints- you got it made my man! Thanks BBQMAN. Hummmmmmm...bikini body painting.......humm you might be onto something here. What is the pipe and valve setup for? I found it, that's funny, didn't know what the liars club was. 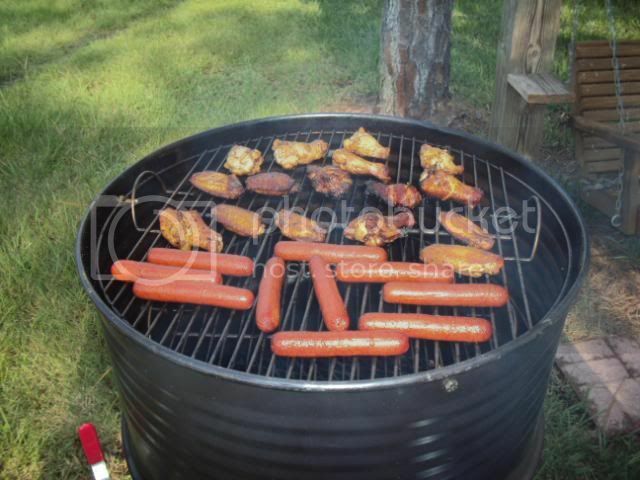 I would guess to let air into the bottom of the drum to keep the fire going, like the air intake damper on any other cooker.